Fittingly for an institution with both a library and a theater, the Folger collection includes a number of promptbooks. Today, to celebrate Folger Theatre’s production of As You Like It opening next week, we’re taking a look at two productions of As You Like It from the nineteenth century. A lot of careful planning and coordination goes into a play, both during rehearsal and live performances, and it’s important for cast and crew to keep track of everything: which scenes need different backdrops? When does each character enter and exit their scenes? What props do they need? Were any lines cut or altered? What if someone forgets a line?? Enter the promptbook, to help stage managers and actors keep their, er, act straight. A promptbook is a version of the play script that is marked up with cuts, changes, additions, entrances and exits, and other stage business such as sound and light cues, costume changes, and lists of props (often called “property plots”). Prompters (a person just off-stage who would feed actors a line if they forgot their place) and stage managers used promptbooks to keep the performance running smoothly. 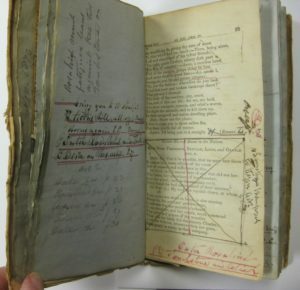 Many promptbooks were made from published editions of a play text, which were then edited and marked by hand for each production. Sometimes play settings (the total set of added or deleted lines, stage directions, etc. ), or a promptbook itself, would be passed from stage manager to stage manager and used for multiple productions. Often they would see severe wear and tear, and would need to be re-covered, with blank paper or any scrap of paper that came to hand, including old playbills. 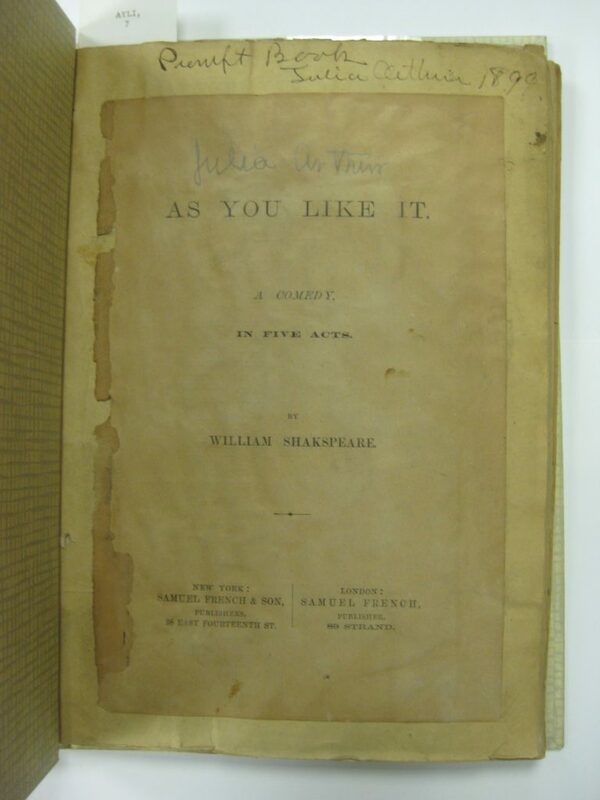 The promptbook above was used in several performances of As You Like It throughout the nineteenth century, and includes annotations and memorabilia for many of them. An added handwritten title page (shown on the right) notes some of its history, connecting it to Charles Kean, Charlotte Cushman, and other actors. Playbills from at least six distinct performances are bound into the volume, and the text features markings in black ink in several handwritings, and red ink in another. One of the sets of notes in black ink is likely from John Moore, a prolific American actor and stage manager, while the red ink, according to the title page, indicates directions from a performance featuring Charlotte Cushman as Rosalind. One of the added playbills likely advertises this performance, at Burton’s New Theatre in New York in October 1857, while another playbill advertises Mrs. [Julia Bennett] Barrow in the role, also at Burton’s but earlier in the year (January 1857). Another promptbook, this one from an 1899 run of As You Like It starring Julia Arthur as Rosalind, shows an even more drastic means of alteration. Its creator actually took apart an edition of the play published by Samuel French (a publisher known for theater and music publications, still active today), cutting and pasting pages together onto larger sheets. This allowed even more space for annotations and directions. This promptbook features detailed reminders for the stage manager at the start of each scene, such as “look for men at backing of door,” “see table is brought on stage, with stools” and “Warn… electrician.” It also includes property plots and a list of characters, indicating which actors will play double roles. If you go to see As You Like It at the Folger, be sure to appreciate all the hard work that goes into a play!